I've had Guerlain's Terracotta Loose Powder Kohl Eyeliner in my makeup bag for some time. I bought it when I first started learning about kohls, and it was the only product in the mainstream US market at the time. They run about $38 each. You can see I have one of the old packages. The new package has a clear bottom. The gold part is plastic, as is the bottom. It is disappointing in terms of luxurious packaging, but practical for daily use and tucking it in your purse. The little applicator sits down in the bottle. It's not hygienic, because that wand does touch your waterline, and at times your eyeball. It is, however, convenient. You can put this in your evening bag and not need to bring a brush to re-apply it. The applicator is a long, rigid wand. It works OK, but it is really hard to control how much product you are using. I often end up with chunks of the product in my eye. It doesn't burn or sting, but it is irritating. If I don't get those chunks out quickly, it makes my eye water, which can mess up my makeup. It also starts to get chunky and flake off when it dries. You should get a few hours of wear before it does that, though. You can use the wand in two ways. 1 - Use it just like an eyeliner pencil. Use the end to go back and forth across your waterline until you have the darkness you desire. 2 - Place the wand length ways along your lower waterline, close your eye lightly, and pull the wand out, towards the outer corner. That will line the top and bottom at the same time. That method takes a bit more practice. Here is a video that does a great job of showing you how to do it. I do love the color. It is a pretty, deep grey with a satin finish and silver glitter. It's really beautiful. However, putting glitter in a product that is intended to be worn on the waterline is just not the best idea ever. Glitter is sharp, and roughly half the times that I wear this, it makes my eyes irritated. 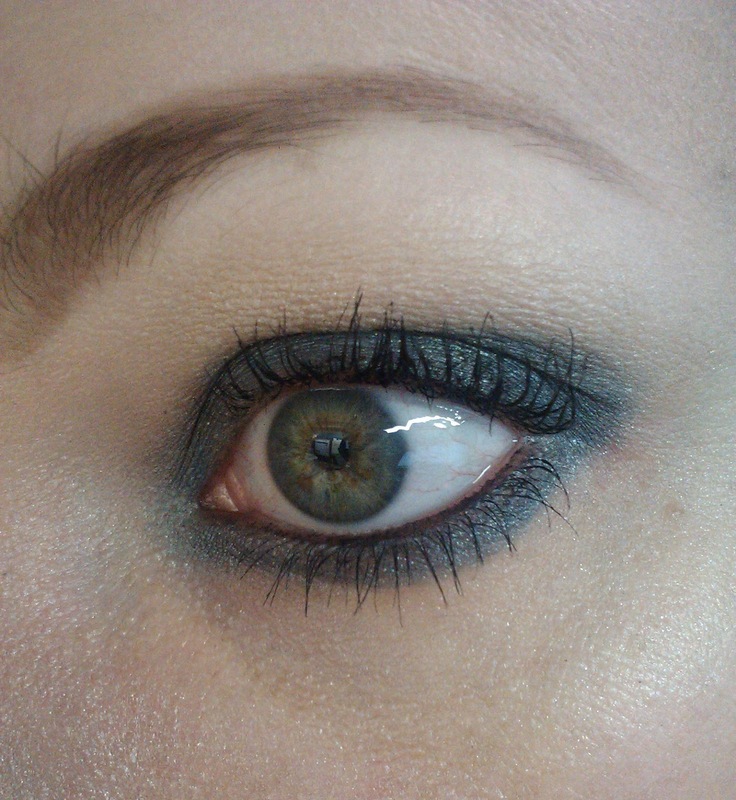 Here you can see it applied to the waterline. You'll notice the parts by each corner, where it has begun to flake off. This photo was take within 20 minute of application. You wouldn't notice this flaking in real life, but after a few hours it does become noticeable. You'll need to keep it in your bag for touch-ups. So, the big question, would I buy it again? No. This product irritates my eyes, has an application method that I find un-hygeinic, and it flakes off rather than fading uniformily. I still use it when I need an emergency touch up (if I remembered to put it in my purse), but otherwise it really doesn't get used. It would work well as an eyeliner at the lashline, but I have so many other products that fulfill the same purpose that I just don't think to use it. This was the first kohl I used, and I really wanted to like it. When I first bought it, I tried it almost daily for a few weeks before I gave up because of it making my eyes red. I prefer Mosha Katani's Eye Kohl (sormeh). Mosha's sormeh is really the only thing that does give me styes. I also find it easier to use than anything else.